The Mongol Empire had fractured into independent khanates in the late 1200s because Genghis Khan's descendants had quarreled and the empire was too big for any one of them to rule. By 1336 the northwestern portion of what had been the empire was ruled by Sultan Mohammed Oz Beg, ruler of what had been called the Golden Horde, itself fragmented into various khanates. Oz Beg's rule extended as far as Moscow, his capital city Sarai on the Volga River. To the south of his territory around the Aral Sea other Mongols ruled. It was in 1336, five years before Oz Beg's 29-year rule ended, that Timur was born, in a village in Transoxiana, He was the son of a pious Muslim who headed the Barlas tribe – described by the Encyclopedia Britannica as a "Turkicized" Mongol "subgroup." Rather than nomads, these were settled people, living in an area of agriculture thirty-six miles south of Samarkand – the major city on the silk road between China and the West. The area around Samarkand was dry and extremely hot during summer. Nevertheless, Samarkand was a cultural center, with mathematicians, astronomers, historians, theologians and poets. In Timur's time Samarkand produced textiles, pottery, bricks, tiles, and its craftsmen worked metal, chiseled stone and carved doors. Samarkand was a city of Turks, Arabs, Moors, Greeks, Armenians and people from India, with many languages spoken and many faiths. The area's principle crops were cereals, grapes and cotton, which were irrigated with water that flowed out of the Hindu Kush Mountains just to the south. Timur in today's Uzbekistan. Respected in Central Asia. When Timur was ten-years-old, Mongol rule suffered rebellion and lost power in Transoxiana, and an emir (warlord) took power there. When Timur was twenty-two the emir, Kazgan, was assassinated, and two years later the Mongols reconquered Transoxiana. With the coming of the Mongol armies in 1360 and 1361, Timur, in the tradition of conquered princes, became a willing vassal of the Mongols. He subordinated his military following to Mongol rule and became a minister to the new Mongol governor of Transoxiana, Ilyas Khodja. Soon Timur found an opportunity to break with his Mongol overlords. At Khiva (400 miles northwest of Samarkand) he formed a coalition with the grandson of the assassinated emir Kazgan. This was Hussein, whose army was greater in size than Timur's. In 1364, Timur and Hussein fought and defeated a force belonging to Ilyas Khodja. Ilyas Khodja withdrew from Transoxiana but returned in 1365, and he defeated Timur and Hussein at what became known as the Battle of the Mud. Hussein retreated to Balkh and Timur to Khurasan. Khodja reconquered Samarkand and other cities. At Samarkand, Islamic rebels called the Serbedar surprised the Mongol force inside the city, killing about 2,000 and driving the others from the city. The Mongols, in turn, laid siege to Samarkand. An epidemic broke out, killing a fourth of its horses, and the Mongols withdrew again from Transoxiana. The Serbedar, numbering about 10,000, controlled Samarkand for about a year. Timur and Hussein returned. Timur saw the Serbedar as a rival power. He feigned friendship with them at first, and much later, after he had gained a more secure position and support in the city, he overpowered and executed the Serbedar leaders. Timur and Hussein resumed their military dominance of Transoxiana, Timur at Samarkand and Hussein at Balkh and other towns. Hussein demanded more in taxes than did Timur, and Hussein paid less attention than Timur to the need for maintaining the good will of his subjects. Timur was shrewd enough to see that broad support at his home base was vital. He made a show of generosity, including helping people with his own wealth. Timur became the most respected person at Samarkand, while reports are that Hussein's reputation for meanness grew. Hussein and Timur were heading for a split, differences having accumulated between the two, as often happens with people who have worked together for years. Timur's wife, who was Hussein's sister, died, breaking a tie between the two. Timur opened hostilities. His and Hussein's armies clashed. A temporary truce was in order to unite to repel another Mongol incursion. Then the war between them resumed. Timur appeared as the friend and defender of merchants and others. He won the support of a man who claimed to be a descendant of the Prophet Muhammad, Sayyid Bereke, a native of Mecca with a great reputation for learning and piety. People across Transoxiana, including princes and local emirs, were climbing aboard Timur's bandwagon. And, as had happened in China when two leaders with armies had vied for power, the one able to win more people to his side won. Timur defeated Hussein militarily, and one of Timur's officers, Keikosraw, who had a vendetta against Hussein because of the death of his brother, brought Hussein to Timur with Hussein's hands bound. Timur is described as having been moved to tears at the sight of his old comrade and former brother-in-law so reduced. Timur is said to have granted his old friend and former brother-in-law free passage so he could make his once-in-a-lifetime pilgrimage to Mecca. Released, Hussein fled, and Keikosraw overtook him and had killed him before he could make his journey. 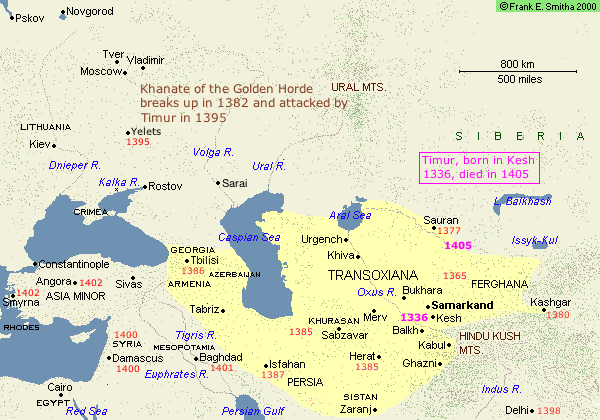 Timur, at the age of thirty-four, was now – in 1370 – the dominant power in Transoxiana. His army was modeled after the armies of Genghis Khan, but with more foot soldiers and drawn more from settled people rather than nomadic horsemen. It was like the armies of Rome that Marius had created – an army whose loyalty was to its commander. Timur's army found glory in Timur's reputation as a great warrior. Timur left Transoxiana under the official rule of a Turkish khan named Suyughghatmish, superior to Timur nominally but not in actual power. Timur described himself as the mere agent of righteous rule and proclaimed himself the restorer of the Mongol empire. To consolidate his power, Timur struck hard against those who had been close to Hussein. Because sons inherited the reputations as well as the property of their fathers, Timur was concerned about Hussein's sons, and he had two of them executed. Two other sons escaped to India, where they soon died. Others who had been close to Hussein were also executed. Timur added four of Hussein's wives to his own gathering of wives, and he distributed Hussein's other wives to his followers. Inhabitants of Balkh who had supported Hussein were bound with chains. Some were beheaded, and their wives, children and wealth were divided among Timur's officers.